Tarilian is a Trader 535 Signature, a trawler style semi-displacement motor yacht with flybridge, full width aft cabin and aft deck. The "Trader" range are traditional cruising yachts. Their looks and design, which originated in the 1980s, are more purposeful than fashionable, but I feel one does not tire of the boat's character soon; it rather goes 'classic' than 'out of fashion'. Trader yachts are designed by Toby Chappell of Tarquin Motor Yachts (UK), and built by Kha Shing (Kha Shing Enterprises) in Taiwan. The boat has been given Design Category "A" Offshore. 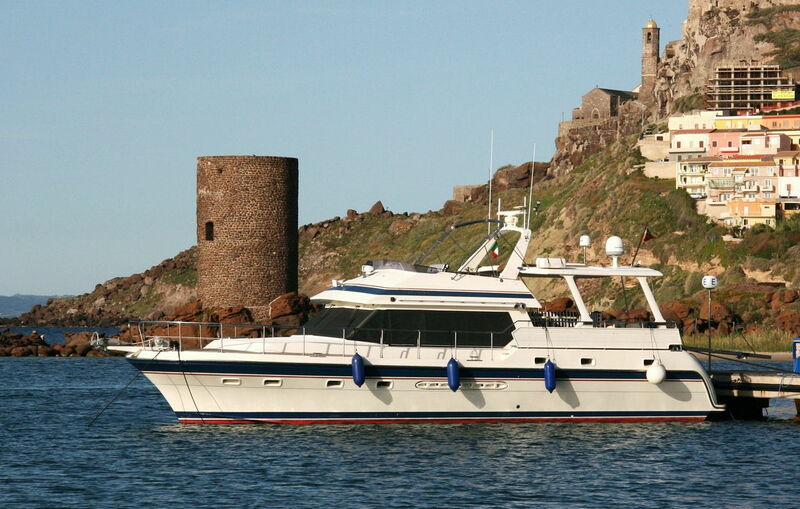 Tarilian was built and first launched in 2000, and is British Part 1 registered. Generator Onan 12kW. Charger/inverter. Air con to all cabins (4 units). Tarilian is equipped with the usual safety equipment and electronics for offshore passages. Our Trader T535 is a seaworthy and commodious cruiser and comfortable live-aboard, which can be handled by a cruising couple. It's neither a fast boat nor an ocean-crossing yacht. Tarilian is able to reach a top speed of 18 kn, but in practise we use a cruising speed between 9 kn to 11 kn, giving fuel consumption of 3.5 to 5.5 litres/nm. The corresponding safe cruising range is (at least) 550 nm at 9 kn, respectively 350 nm at 11 kn. In general, we find cruising at semi-displacement speed around 10 kn comfortable; we also like to go at 8.5 to 9 kn, displacement mode, over shorter distances, and, when going against swell to reduce spray. 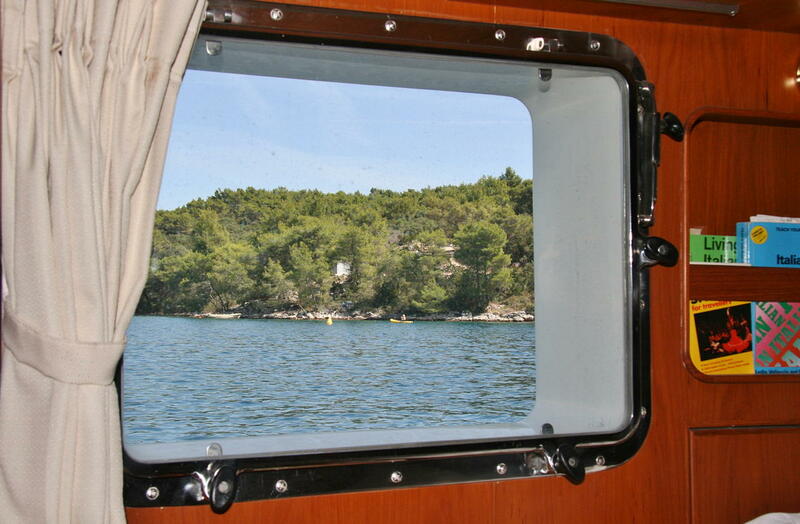 Moored on buoy in Croatia; swimming ladder and shower are ready. A Roman castle ruin creates a historic background. From the aft deck a door and staircase lead into the saloon. Ceiling height is a convenient 6ft7'+ (200+ cm) throughout the boat. But, taking the stairs too hastily still bears a small risk of knocking your head. An unneeded settee on the opposite side of the dining table was converted into a TV/hifi rack with a subwoover in its base. 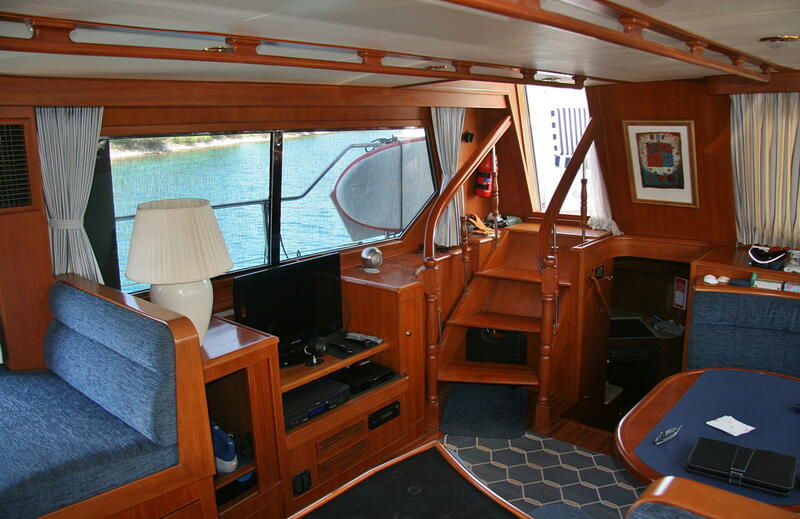 The saloon includes the interior helm to starboard, with a driver seat next to the side door, and a navigator seat to port with a large chart table. Anyhow, the interior helm is rarely used by us fair weather sailors. It's quieter on the flybridge, too. The locker underneath the helm seat, to right, houses the bar trolley; the drinks' fridge is opposite, on the left side. 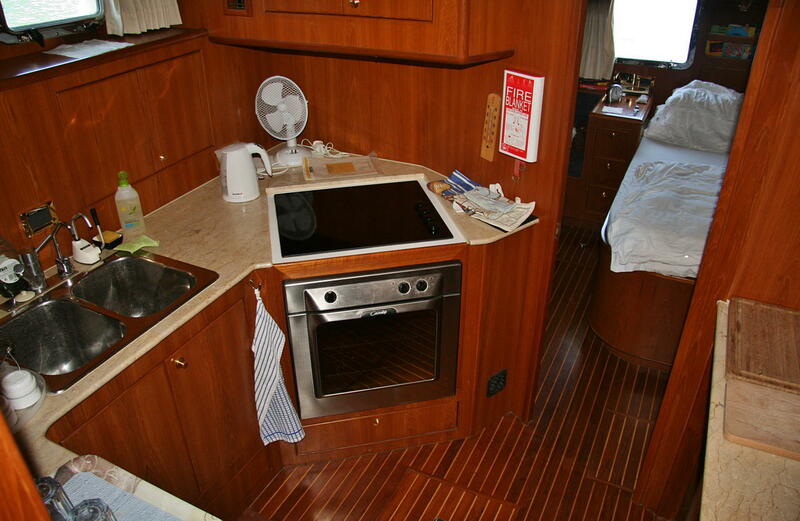 The galley is located downstairs to rear. It has space for household size equipment, proper work surfaces and a range of eye level cupboards, and is fitted with a fridge, freezer, microwave, dishwasher and washing machine. 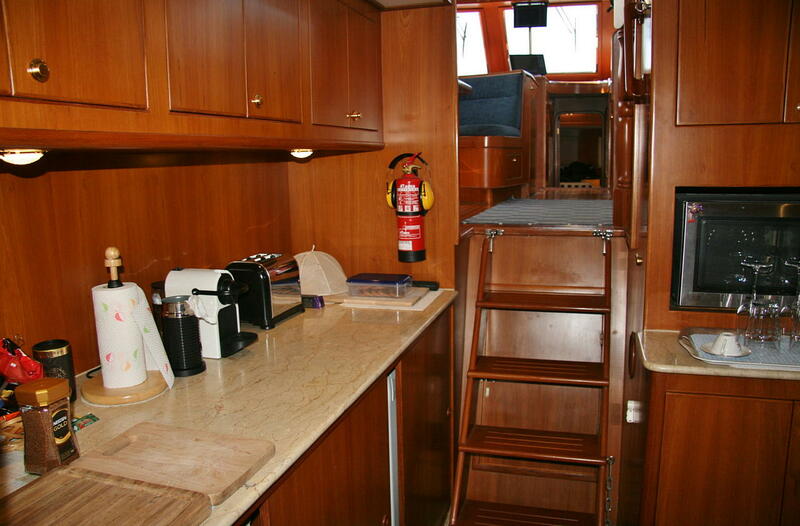 Galley looking towards saloon. Sitting on top of the fire extinguisher is a set of ear protectors for those dreaded engine room checks underway (via door behind lifting steps). 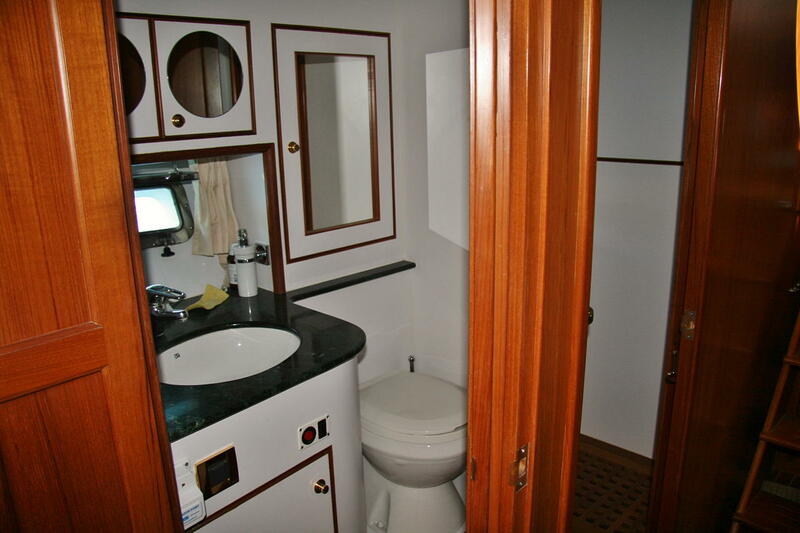 The full width master cabin (aft cabin) is one of the boat's boons, it offers a walk around king size bed, two wardrobes, plenty of storage cupboards and drawers, a side seat and cosmetic table, and an ensuite bathroom with a small bath tub. 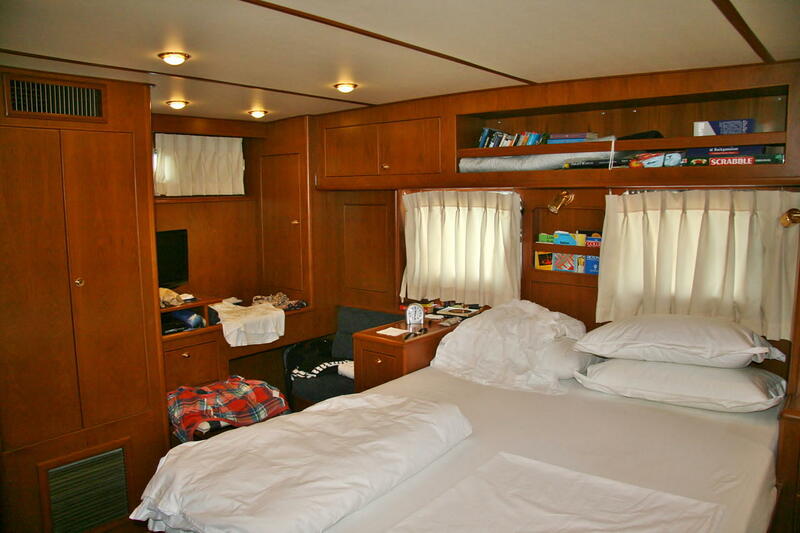 In the forward part of the boat is a substantial bow cabin, also with a king size double bed, a twin bed side (guest) cabin to port, and a toilet/ bathroom to starboard. My 'office conversion': I had one of the two single beds in the side (3rd) cabin converted to provide an ample writing/computer desk with drawers under. For those who want to know it all: The engine room is below the saloon floor. There are access doors from the galley and the front corridor; for larger service access there are two lifting hatches in the saloon. Before buying this boat in 2009 I had done my homework and been monitoring the used boats market on the web for more than two years; new and nearly new boats were out of my financial reach. I had owned boats before and had skippered a number of chartered vessels in the Med. 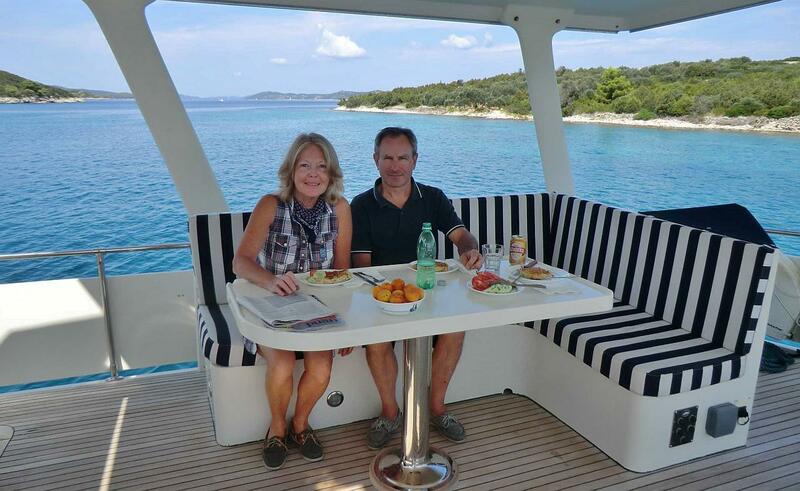 We had experience with a range of planing and semi-displacement flybridge yachts and sport cruisers. 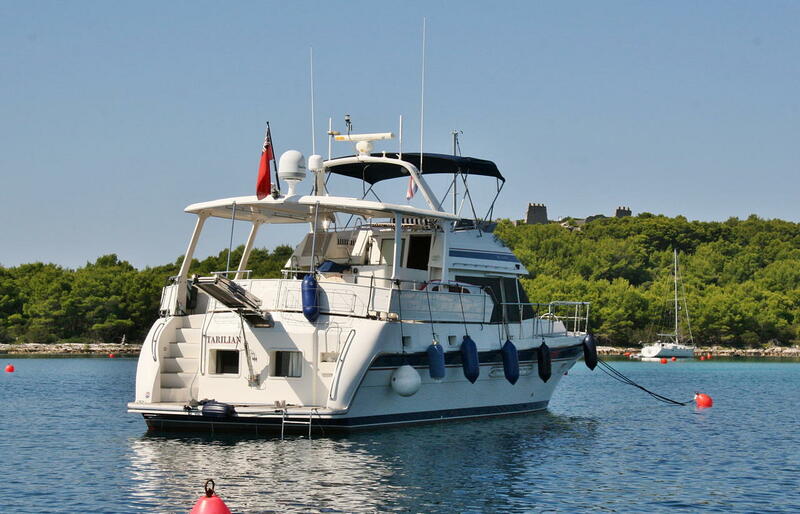 Our own cruiser for the Med should offer comfortable live-aboard quality for a couple and be kitted out to suit our needs better than a charter boat, and extend our cruising range. Our aim was to do coastal cruising in our own time, and to stay in places we liked. I preferred a sturdy 'traditional' boat, on which everything made sense; a flybridge was a must, as was a swimming platform for the Med. We had come to like spacious semi-displacement yachts with good cruising credentials, aft cabin, and the comfort of high quality woodwork inside. Why a Trader 535? 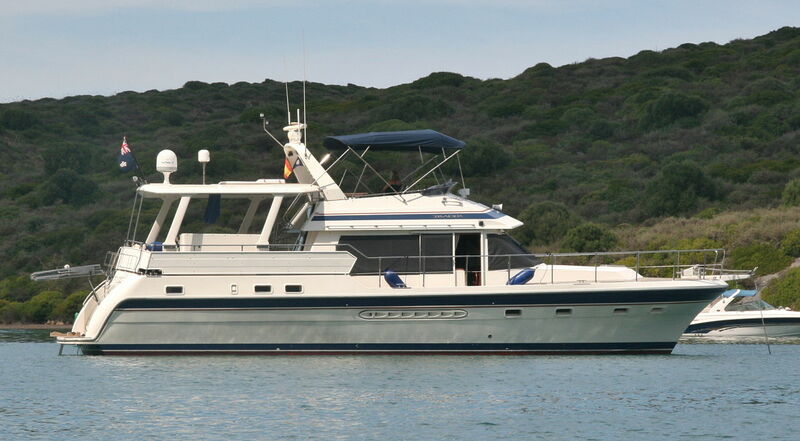 The 'Classic Trader' range, and in particular the 535 models, ticked all the boxes with their blend of traditional trawler and modern features (such as sea stairs and moulded swimming platform), well balanced accommodation, large covered aft deck and wide side decks. At under 17m length over all the 535 is not too large to find a berth in most Med harbours and marinas, but avoids compromises in the space found on smaller boats and planing hulls. The 535 has been relatively popular, that means there is usually a good choice of examples on the used market. Traders are semi-custom boats, each is slightly different, therefore having a choice matters. Tarquin Trader Yachts, based on the UK south coast, further helped to us to learn more about their boats and compare different models. With market knowledge, clear preferences and an overall budget worked out, it was easy for me to narrow the number of boats to view down to just three or four, when I had the cash ready and the time was right to go ahead with a purchase. Why buying it in the UK? It might have seemed more practical and maybe cheaper to buy a boat for the Med that is already in the area. I explored this, but the availability of several examples to choose from was in favour of the UK. Also, I wanted to manage the refurbishing works myself. Living in London, working with UK yards and contractors in such a project is just far more efficient than with companies abroad; the same is true for finally kitting the boat out and trying it nearer to home. In hindsight, it also gave us the opportunity for an epic journey to the cruising destination; just the kind of trip those boats are very capable of. 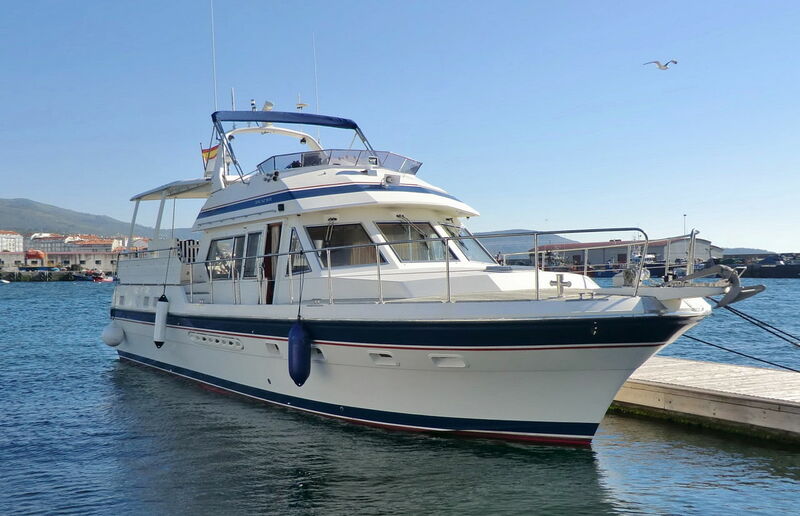 We found Tarilian, a 535 Signature model of early 2000, pleasing on and under deck; saloon and flybridge layout suited our requirements as a cruising couple well, better infact than later examples, including Sunliners, we had seen; I was familiar with Volvo engines from my previous boats, and, the asking price seemed fair. 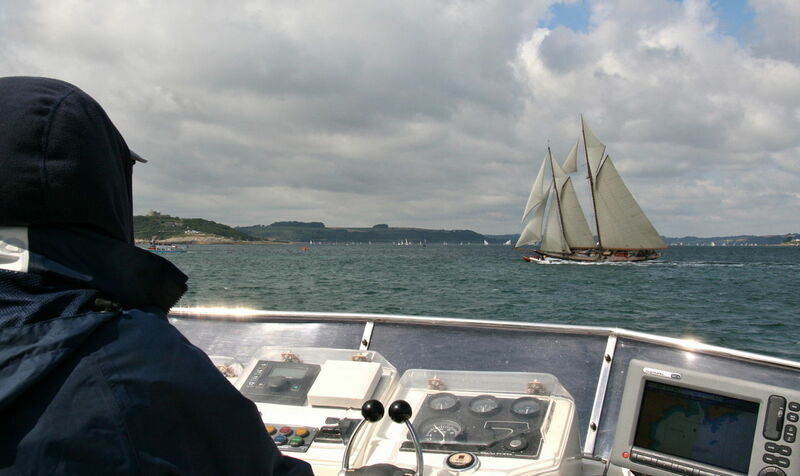 I bought her from her first owners in Falmouth in autumn 2009; she had been dry stored at the yard for some time waiting for a new owner. Tarilian had been cruised in Spain and driven back to Falmouth; the boat had a good general specification, including a passarella and air conditioning, and appeared to be in sound condition. However, after 10 years she obviously needed substantial refits and upgrades to bring her up to the standard and specification of newer boats. Before the re-launch in May 2010 I commissioned a comprehensive overhaul of the mechanical and electrical/electronic systems. 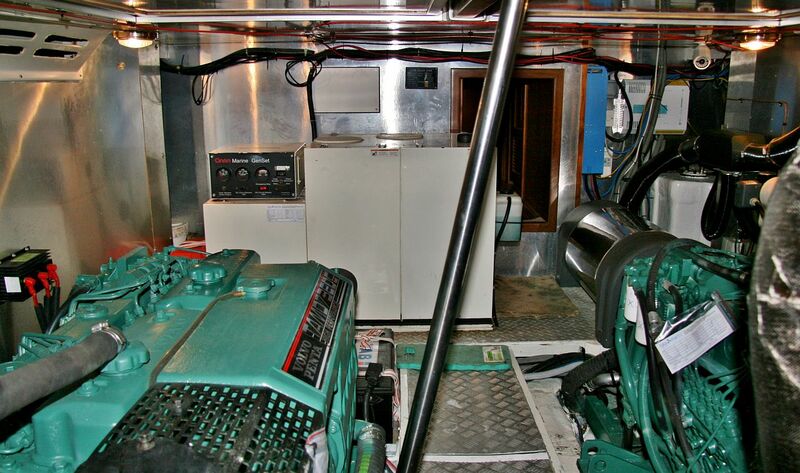 Plumbing, board electrics, including a new inverter, navigation electronics and a number of instruments were refitted to current standards respectively added; diesel heaters and satellite broadband were installed. Extra cleats and grab rails were added for safety and ease of use. A boarding ladder for the side deck gates was custom made. Nylon couplings were fitted to the shafts, and rope cutters to the propellors. 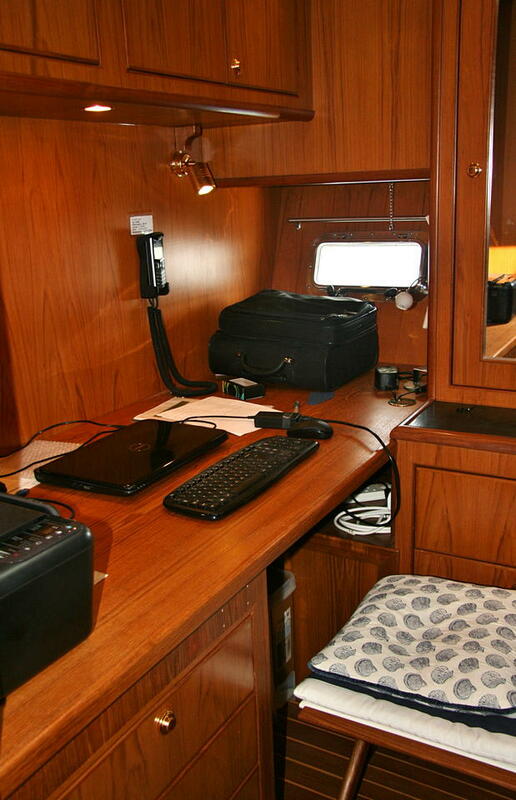 The side (3rd) cabin was modified to become my skipper's cabin with an ample writing/computer desk. 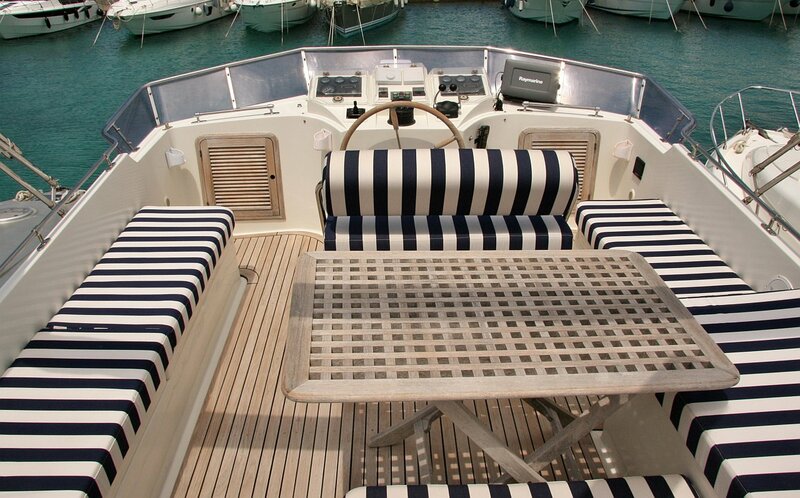 In 2010 Tarilian also received full sets of new cushions, curtains, mattresses and outside covers; and, finally, a new console rib tender. For Mediterranean style stern-to docking, in particular when short-handed, I wanted a third helm station on the aft deck. The L-shaped moulded aft deck settee had been factory fitted right on the starboard edge of the aft deck; it needed to be moved towards the centre, and a little forward, to allow passing behind along the rails when picking up and taking the (heavy and muddy) mooring line (ground rope) from stern to bow, and to give more space for managing shore lines. 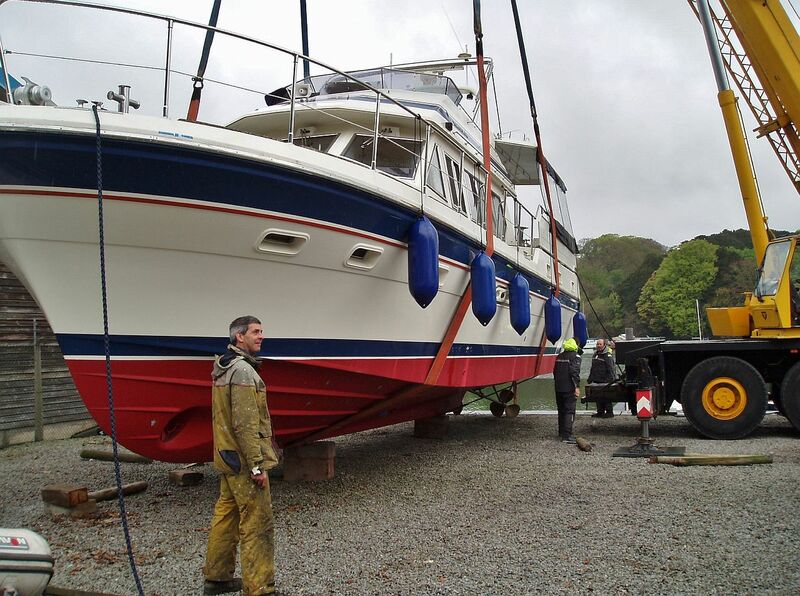 The aft deck settee, with cables inside, is being moved to a new position; a third set of engine controls is installed at its rear. By April 2010 the works at Falmouth Yacht Brokers' yard are well under way, rubbish is piling up. The boat has certainly kept its promises and been suiting and exceeding our requirements as a cruising couple, and occasionally with a guest. We have never felt a lack of space or comfort, and living on board for three weeks or so at a time is a pleasure; I know other owners who stay even longer. Tarilian has become our personalized home for those periods of the year, and it would be unthinkable to share it with unknown others, as people do who put their boats into charter. Tarilian has proven capable of relaxed and steady passage making. I have never felt a lack of available engine power. Whilst the boat does not offer sporty handling or the frightening excitement of planing speeds (we are not looking for that), cruising is much faster than on displacement-only vessels. The Trader hull, with its traditional semi displacement shape, has a tendency to roll in seas from abeam and aft quarters. It is more of concern for passages in the long Atlantic swell than in the Med, and it's about comfort rather than safety. Although there is nowadays an increasing marketing pitch on stabilizers for smaller boats, retro-fitting stabilizers to Tarilian would neither be technically easy nor affordable to me. I am carefully avoiding such sea conditions when planning a passage in the open. As a leisure skipper I insist on taking time and waiting for a favourable forecast rather than putting the crew at risk of any prolonged dodgy ride. Regarding running costs; the much talked about fuel consumption of motor boats is not so bad in case of Tarilian: Based on our average usage (of 600-900nm in a season), the cost of fuel amounts to only a modest percentage of the total annual costs, around 20% or less. The lion share of costs goes towards berthing fees, maintenance, repairs/renewals and upgrades. Costs of labour and yard costs such as craning are going up year on year. At this point a personal comment about my experience during cruises: To keep everything on a sizeable boat in good condition and running order (without employing a permanent professional skipper), the single handed owner operator has to be ready to act as cleaner, handyman, trouble shooter, electrician, and even ad hoc mechanic or plumber when need arises. Need keeps arising, it's a boat! By the nature of cruising, service men are hardly ever available at the time and place you want them. Magazines and books do not prepare you for it; you learn by practical experience. Of course, all boats are different, and, it is up to the skipper how much or little he does, but it might show. An upgraded anchor (Rocna); a custom made teakwood door to the aft deck locker; underwater lights (yes! 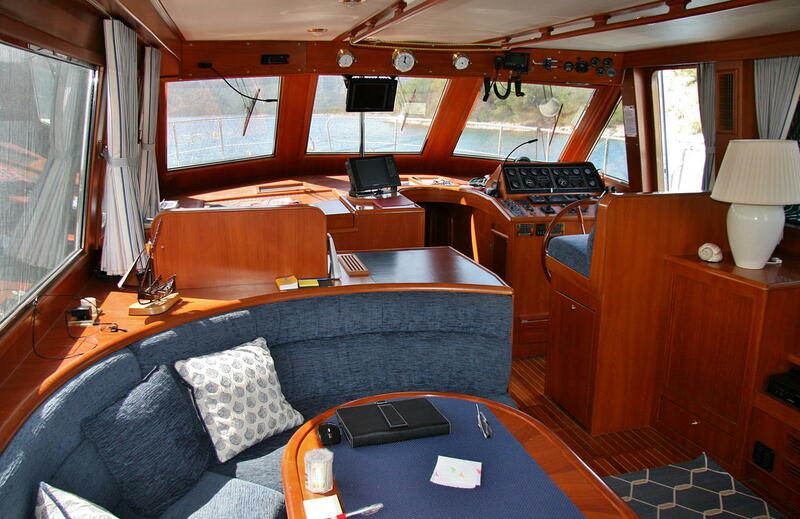 Nice in a bay for a night swim); courtesy and stair lights (for safety) inside and out; winches for mooring ropes on the bow; bilge alarm; sun covers to protect the aft deck settee, and more. 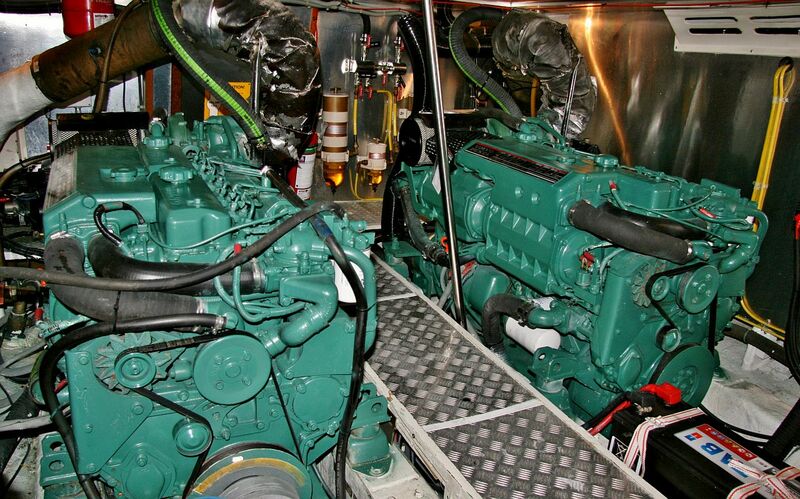 It goes without saying that annual engine and generator servicing, antifouling, maintenance and replacements are being carried out regularly; in spring 2015 I commissioned a major service of the Volvo engines. A Trader 535 is a tall boat with high windage. For stern-to Med mooring under side wind, a stern thruster helps - particularly if you are cruising short-handed as we do. Previously, in the UK, I had seen this an unnecessary extra for a boat like ours. However, after repeated stressful mooring situations under wind in Croatia, I do feel it is needed for safety and for the additional degree of control during close quarters manoeuvres that helps reducing risks and stress. I had one fitted as part of the annual pre-season works in spring 2017. 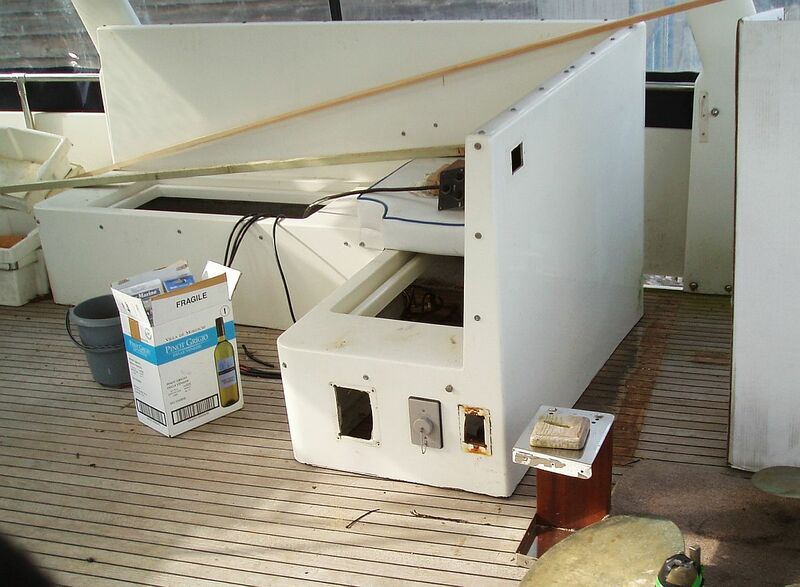 At that time I also had the front teak deck refitted which had been in the weather since the boat's launch in 2000 and had started to deteriorate. 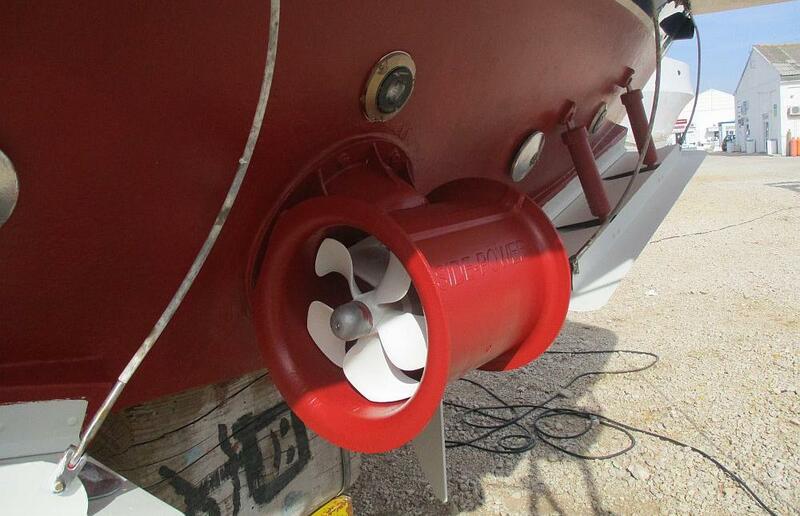 In March 2017 Tarilian received a powerful electric stern thruster; and a new front teak deck. Our 3.1m Walker Bay console rib tender fitted fine onto the aft platform of a Trader 535 Signature in the UK; but it 'filled' the platform to its edges. Its prop shaft was in the way and made going for a swim a struggle for less-athletic members of crew, despite a small extra boarding ladder was fitted under the platform (Looking around, I think this is a familar problem for several Med boaters!). By end of 2016, after six seasons, the Walker Bay tubes had suffered damage from the sun and become unsightly. 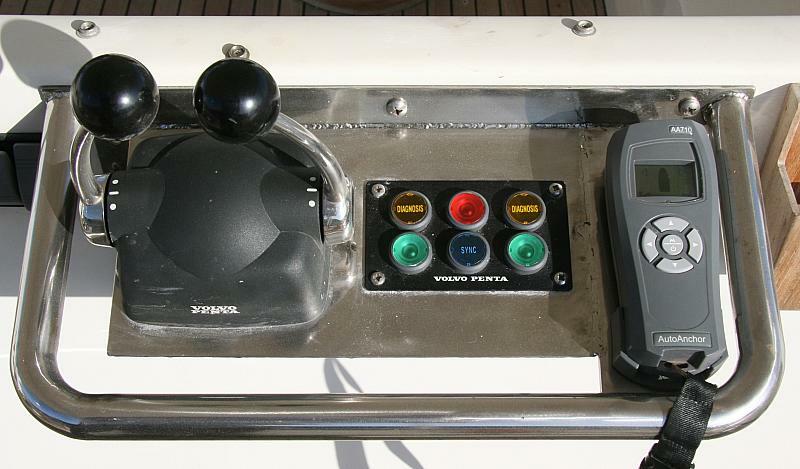 It looked for a new, equally capable and affordable console tender, but a little shorter so it would leave space to get past the prop; I went for a model from Brig, and for an outboard engine with electronic fuel injection for reliable starting. To complete the convenient swimming arrangement, I had an additional 'swimming pool style' bathing ladder custom-made to go on the corner of the aft platform. When not in use it has it's place on the aft deck. One of the pleasures of boating is to spend days in a bay, or on moorings away from shore power. I felt that having to run the generator for hours every day, just to replenish the energy used by two fridges and other equipment over 24 hours, was a bit inconvenient. As part of the 2018 pre-season works I had a set of solar panels fitted. I note, however, that the practically experienced charging performance of such an installation is lower than anticipated. At the same time the outdated noisy sat TV antenna, which had become unreliable, was replaced with a future-proof unit (DVB-S2, GPS auto-scew). Also, a 3G/4G mobile aerial was installed on the radar arch to improve reception of the wi-fi router. In April 2018 three 160W solar panels were fitted to previously unused roof areas. The new sat TV dome (KNS) is seen at the back. (The small dome 'Sailor' is a sat phone/data antenna, only in use when offshore passages are planned). 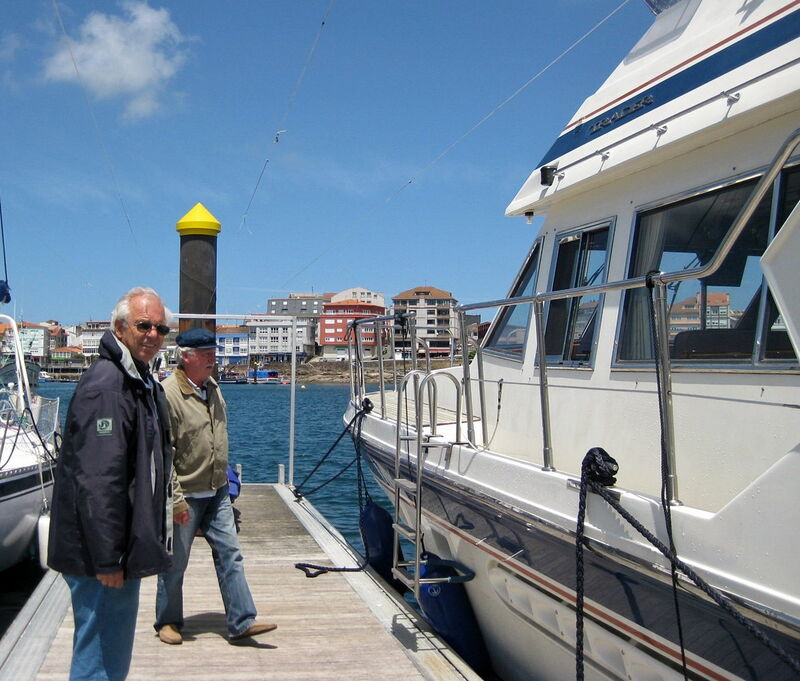 When moored alongside, seen here in Galicia (2011), Tarilian looks and feels like a 'little ship'; she is equipped so that crew can get on and off easily. All content on this page belongs to whartl.com and must not be used for commercial purposes as a whole or in parts. Quoting or re-publishing of any part requires the explicit consent of the author. Views expressed are the personal opinion of the author at the time of writing. All information is provided in good faith and believed to be correct at the time of writing. No responsibilty is assumed for its correctness, completeness, and any consequences of using it. By accessing this site you agree to those Terms. The author has no affiliation with Trader Motor Yachts, Tarquin Motor Yachts or any marine sales and marketing business.